In the world of ice cream, strawberry is considered one of the major along with vanilla and chocolate. It’s one of the big guns you can find in traditional Neapolitan, and there are plenty of great versions that focus on strawberry specifically. It also happens to be one of the easiest flavors you can make at home. You don’t need a culinary degree to make a wonderful of variation that combines fresh strawberries and natural ingredients. Medium-size fresh strawberries are the key to this delicious recipe. It might be tempting to go with frozen strawberries that are already trimmed, but take the time to buy fresh ones and cut off the tips yourself (you’ll thank yourself for taking this extra step). Medium strawberries also tend to be sweeter so avoid the big ones that are a bit too large to be natural. A strawberry puree is the secret to this recipe, and you can make it as smooth or chunky as you like. One variation is to make a complete puree, then set aside some chopped strawberries to add during the mixing process. Combine your strawberries, 1/4 cup sugar, and lemon juice into a blender and mix until smooth. Combine your salt and cream into a heavy sauce pan and heat it until it’s just simmering. 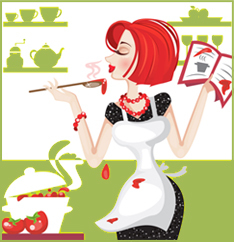 In a separate bowl, combine the remainder of your sugar and eggs while whisking thoroughly. You can use just the yolks if you like for a slightly heavier final result (in this case use 3 egg yolks). Add your heated cream to your egg mixture and continue to whisk. Return all of these ingredients back to your sauce pan and heat over medium until it thickens naturally. Let your custard cool at least two hours in your fridge. If you’re using a standard ice cream maker that requires a pre-frozen bowl, this will be the perfect opportunity to freeze your bowl as well. While these two elements chill, you can use the time to prepare dinner or simply relax. Once your custard and bowl are at the right temperature, it’s time to finish off the process. Take your puree mixture and pour it into your custard while mixing the whole time. When everything is blended evenly, add it to your ice cream maker and turn the machine on. 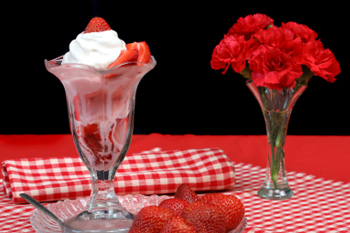 In about 20 to 25 minutes, you’ll have the perfect version of soft serve strawberry ice cream. If you want to harden it up, return it to your freezer to get it to a perfect chilled consistency. And remember, you can also add extra goodies like bananas, nuts, or chocolate into the mix while everything is churning. This strawberry ice cream recipe comes to us from icecreamakers.com where you can find more information on dessert ideas or reviews for the best ice cream maker for your own kitchen.